With heavy hearts we ventured off the B & K Rd, and up the re-activated forest service road to view the clearcut destruction of the former ‘Twist & Shout Forest’, Sunshine Coast, BC. 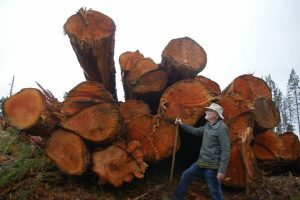 Here the timber industry goes again “killing the goose that laid the golden egg”. 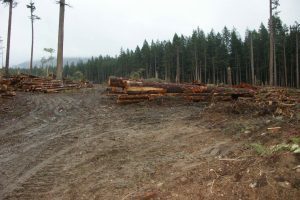 The replacement forest (tree farm) that will replanted here, will never, ever produce the same amount of timber volume that this natural forest grew. 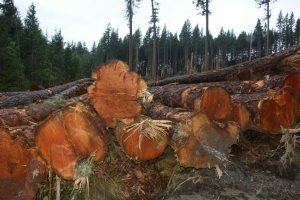 So, its sheer greed when they clearcut log wiping out the integrity and richness of these natural forests. BCTS this will be your last cutblock on the lower slopes of Elphinstone. Respect the Sunshine Coast Regional District OCP Bylaw 641 that calls for a larger protected area, and the shishalh Nation’s 2014 statement on Elphinstone that calls for full protection on its traditional lands west of Roberts Creek. Hans counted over 20 big trees blow down on the edge. 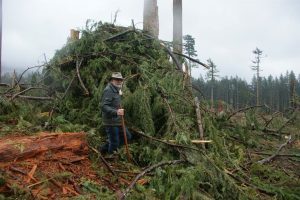 And this was just the 1st storm to come into the clearcut just a few weeks after logging. 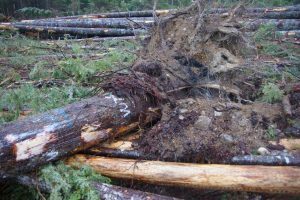 BCTS will say its collateral damage, or this is nothing, or we expected a few trees to come down. 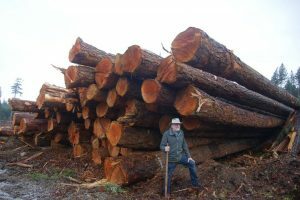 STOP CLEARCUT LOGGING IT A DISGRACE TO HOW FORESTS ACTUALLY EVOLVE. These large openings cause wind dynamics that are very hard to predict. When wind enters the clearcut opening and changes direction then the Venturi-effect says velocity can increase 2-3X fold. — at 10 mins. above Roberts creek, BC. — at 10 mins. above Roberts creek, BC. This forest had a huge open under-story thanks to these tall trees. One could look skyward towards the canopy. Now its a graveyard of dimembered trunks. — at 10 mins. above Roberts creek, BC. We measured out these trees lengths at 150ft. Super tall for thier diameter. Age estimate at 160 years. — at 10 mins. above Roberts creek, BC. 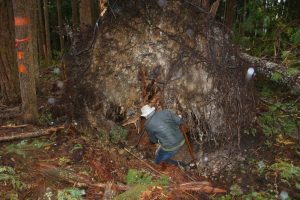 Blowdown of a supposed protected Western White Pine tree – an endangered species. Note WT (wildlife tree) sprayed in white paint. — at 10 mins. above Roberts creek, BC. After constant log hauling for over 2 weeks there’s still many, many loads left to go. 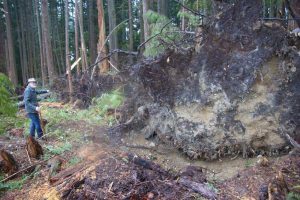 ELF spent over 2 years trying to stop this logging, we went to Court 2X in this effort. 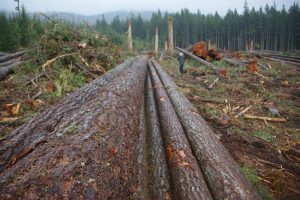 The community came out in strong support, but in the end, the Timber State of BC got its way. — at 10 mins. above Roberts creek, BC. Compacted soils destroy the organic layer. Looking North towards the Elphinstone back ridge. — at 10 mins. above Roberts creek, BC..
Peninsula Logging began cutting with a feller buncher in early October after a 2 month stand-off with protesters. A dozen people were arrested in peaceful protests. It was a stressful time to know of the destruction that awaited this ecosystem. 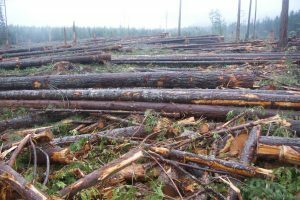 Clearcut logging is ruthless. Its exactly the same as driftnet fishing, in that its destroys most everything in its path. And, they keep at it in this Province when they should know better. — at 10 mins. above Roberts Creek, BC. It was such an amazing forest. Zero value placed on it by the Province until it was cut. Accounting of its environmental services (carbon sequestering, habitat, tourism, recreation, oxygen production, water retention, etc, etc.) must be acknowledged. 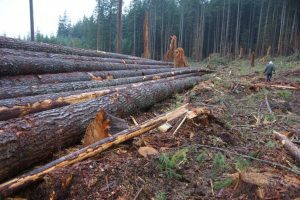 Provide, local loggers jobs thinning out the even-aged tree farms that surround the Elphinstone natural forests. Shame. The tree branches denuded from the trunks. Each needle was a solar panel. 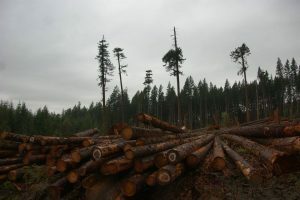 How much carbon was lost when these many 1,000’s of trees died? Not calculated by the Ministry of Forests – oops. — at 10 mins. above Roberts creek, BC. This one into the ‘Special Management Area’ that BCTS planned as protection to East Roberts Creek. Note its on the other side of the falling boundary. — at 10 mins. above Roberts creek, BC.